Before knowing what a trap bar deadlift is, we have to become familiar with the trap bar itself. This important piece of strength training equipment is also known as a hex bar. The trap bar is a weight training device invented by Al Gerard, a competitive powerlifter from North Carolina. The trap bar is also known as the Gerard Trap Bar as well as a hex bar. It is called a hex bar because of its hexagonal shape. 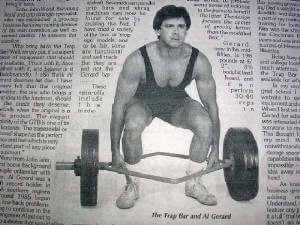 Al Gerard created the trap bar because he had a back injury which kept flaring up when doing straight barbell deadlifts. Al Gerard patented and invented it to prevent lower back pain deadlift injury. His device moves your body into the center of gravity of the weight as opposed to behind it. How heavy is a trap bar? The “Classic” Gerard Trap Bar weight is 45 pounds, the same weight as an Olympic Barbell. 1. In the traditional barbell deadlift, the straight bar is in front of your body which increases the stress on your back and knees. The trap bar eliminates the vulnerability of your lower back and knees when deadlifting. This is because the weight is closer to your axis of rotation. As a result, the hex bar deadlift puts less stress on your back and knees than the conventional barbell deadlift. 2. In the barbell deadlift, the straight bar will rub against your shins and knees while you are deadlifting with proper deadlift form. This is an excellent reason for you to wear deadlift sweatpants and deadlift socks when doing a straight bar deadlift. The hex bar deadlift eliminates the problem and pain of the bar hitting against your shins and knees. 3. In addition to the benefits of trap bar deadlifts over barbell deadlifts, shoulder shrugs and bent over barbell rows are also going to be more comfortable for the same reason that the barbell is no longer in front of your body increasing stress on your back and knees. 4. The hex bar also eliminates the need to use a mixed grip, which is a risk for bicep tear injury in the conventional deadlift. 5. According to Chris Beardsley, strength training expert, “studies show that the hex bar deadlift involves greater peak force, bar speed, range of motion, and peak power outputs compared to the conventional straight bar deadlift”. This makes the hex bar deadlift a great choice for building strength and athletic performance. A hex bar deadlift demonstration of proper form and execution by Joe Arko. You can see more full length quality fitness videos at Trainer Mash. Are Trap Bar Deadlifts Easier? The answer is yes. They are easier on your back and can reduce the fear of lower back pain deadlift injury. Al Gerard discovered that he could still build overall strength and size for his back, legs and arms training with his new invention. While the risk of injury is less with the hex bar, you can still build your arms, back, legs and shoulders with progressive resistance training. If you do not have a trap bar available, using dumbbells is a good alternative. Unless the weights are so heavy that there are no dumbbells available at that weight. The trap bar Romanian deadlift is an excellent substitute for the standard Romanian deadlift. To see the hex bar Romanian deadlift, click here. Trap bar shrugs are a good substitute for straight bar barbell shrugs. The disadvantage of the straight bar barbell shrug is because the weight is in front of you and not on the side. As a result, you will be working out your upper trapezius muscle more that your lower trapezius muscle. The solution is to use either dumbells for shoulder shrugs or the trap bar. The hex bar will win over using dumbells when the weights that you use for the shrug will go up significantly. It is much more convenient for hundreds of pounds of weight than to find dumbbells at that weight level. The trap bar squat is a good alternative for people who do not like to squat with the barbell on their back. The trap bar squat will relieve your back and spine from handling excess stress from the weights. You will see that you have to bend your knee more when using the hex bar, as opposed to a conventional deadlift. To see an example, check out this video. Trap bar jumps or trap bar squat jumps are an excellent exercise to increase your vertical jump. As with most hex bar exercises, you can also use dumbbells if you do not have access to a trap bar. Bret Contreras writes extensively about sports and exercise science. He selected the trap bar deadlift as the one go to exercise if he could only do/prescribe one lift. The trap bar deadlift is a mixture between a squat and a deadlift. It utilizes more quadriceps than a typical deadlift and more hamstrings than a typical squat. For this reason, renowned strength training author Stuart McRobert mentioned that it should be called a squat-lift. Simply put, the trap bar deadlift is more hip-dominant and will build the quads, hams, glutes, erectors, lats, traps, and grip musculature and build a ton of functional strength and power. The only drawback is that it wouldn’t build upper body pushing strength, but as far as one lift is concerned, it’ll do more than any other exercise would for building total body muscle and creating favorable adaptations for increased athletic capacity. Read more of Bret Contreras on the hex bar deadlift. What is the difference between the dead squat bar and a trap bar? The answer is how much weight you can load up. The trap bar can usually hold about 500 pounds. The dead-squat bar can go up to 800 pounds. Step in the middle of the trap bar after you have loaded the weights. Then, perform the workout of your choice using the best form possible. Variations of the original Gerard Trap Bar are produced by several vendors. This page lists a variety of hex bars. The trap bar deadlift is an excellent alternative deadlift exercise. But even more than that, some studies show that it is superior as a strength training tool. No matter what deadlift variation you choose, know that the deadlift is one of the most powerful exercises you can do to improve your health and fitness. Therefore, whether you are looking to lose weight or dramatically change your body, start deadlifting today. Here is an excellent beginner deadlift workout routine and deadlift program which I use myself. The deadlift helped me lose 75 pounds in 6 months and change my life. I am confident any type of deadlift variation you stick with will do the same for you.